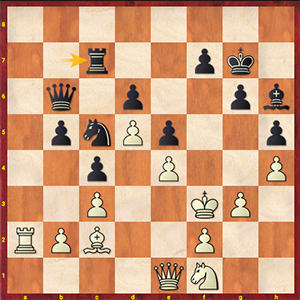 Black did not hesitate much about 27…Bxc4. Magnus Carlsen suggested 27…Kf8 as allowing Black to stay in the game. Meanwhile, after 28. Rxd6 Qxd6 29. Re8+ Rxe8 30. Qxd6 Rxe4 31. Qxc6 there arose an endgame in which the white queen was superior to Black’s bishop and rook. Being pressed for time, Black failed to find a harmonious setup before the first time control, during which period White eliminated the queenside pawns and started advancing his c-passer, stopping which cost Black his bishop. His subsequent attempts to engineer a fortress failed as well, and the Bulgarian grandmaster recognized his defeat on move 56. When the game was over, Magnus voiced his other than happy feelings about the course of the game as being rich in mutual errors. Going down a third time in a row is David Navara. As it often happens in supertournaments, once the top players see a victim, they would zero in on it to deliver blow after blow. In round seven the Czech grandmaster went down as White to Ding Liren. Not only was Black comfortable out of Ruy Lopez, he got down to methodically taking over in the middlegame. David Navara disliked his position out of the opening. The Chinese grandmaster directed his efforts towards the queenside and was poised to carry out a decisive breakthrough. Opening up the c-file to infiltrate the white camp with the heavy pieces. 34…Nd3! 35. Bxd3 cxd3 36. Ra1 Rc2. White resigns. Celebrating his 30-year anniversary on April 26 was Rauf Mamedov. Our congratulations to Rauf! Although the organizers gave the grandmaster a present before the game, taking a bigger gift of defeating Anish Giri with the white pieces was beyond Rauf that day. The opening was a Petroff Defence. The Dutch player assessed him middlegame position as not worse already. Black was already for choice in the queen and knight ending, and White’s position started raising slight concerns when Black managed to take control of the e-file. 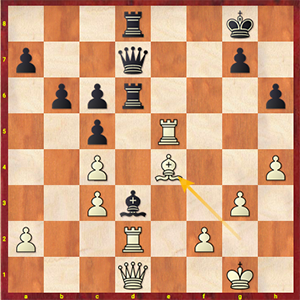 However, Black’s imprecise play at a certain moment prevented him from squeezing the most out of it. A draw by repetition was forced prior to the time control move. The end of press conference was marked by volunteers entering the room to music and fireworks with a cake in hands, and all people present congratulated Rauf on his birthday once again. Radoslaw Wojtaszek and Sergey Karjakin were sorting things out in the Bogo-Indian defense. The queens were traded off relatively early and, despite White’s space advantage, a draw seemed the most likely outcome. There was a moment when Sergey did not go for the repetition, but decided to go on fighting. All in all, it was never beyond the realms of equality, but shortly before the time control Black missed an unpleasant blow and, should Radoslaw have spotted it, he would have got decent chances of winning the same-colored bishop ending. But it was not to be, and the game gradually ended in a draw. Mamedyarov – Radjabov was handled into a double fianchetto of the Grunfeld Defense. White was fighting for the initiative, but Black’s precise play thwarted all threats. The game was a relatively quick draw in a minor piece ending. Leading the field after seven rounds with 4.5 points is Magnus Carlsen. Veselin Topalov, Anish Giri and Ding Liren are trailing half a point behind. Radjabov - Karjakin, Topalov - Wojtaszek, Giri - Carlsen, Ding Liren - Mamedov, Mamedyarov - Navara.